Conglomerate Sime Darby Bhd has put up for sale its decade-old hotel in the heart of historical Malacca. The five-star 496-room Hotel Equatorial Melaka will probably be sold for an estimated RM180 million, or roughly RM363,000 per room, sources told Business Times. The sale is said to to be in line with Sime Darby's intention to sell non-core businesses. Hotel Equatorial Melaka is owned by Syarikat Malacca Straits Inn Sdn Bhd, in which Sime Darby holds 55 per cent and the Malacca state government 30 per cent. The rest is held by Hotel Equatorial (M) Sdn Bhd, which is also the operator. Sime Darby officials were unavailable for comment. Sources close to the deal said that Zerin Properties has been appointed as the exclusive agent for the sale. Zerin Properties could not be reached for comment. A source, who disclosed that several offers have been received for the property, said the agent was hopeful of completing the deal by the year-end. If Sime Darby got its asking price, based on its interests, it could get as much as RM99 million from the sale. It is believed that the hotel, with average occupancy of more than 60 per cent and average room rate of RM180 per night, made some RM37 million revenue in its last financial year. Its earnings before interest, tax, depreciation and amortisation last year stood at around RM11 million. Malacca, the third most visited state after Kuala Lumpur/Selangor and Penang, was proclaimed a World Heritage Site by the United Nations Educational, Scientific and Cultural Organisation (Unesco). Last year, it welcomed 7.2 million tourists. It projects 8.4 million arrivals this year. By 2010, it hopes to attract 13 million tourists. Hotel Equatorial Melaka, located in Bandar Hilir, is a 22-storey building with three basement floors for parking. It has seven food and beverage outlets and a ballroom seating capacity of 1,300. The hotel is within walking distance of the A Famosa fort and the Stadthuys. According to a Sime Darby website, its hospitality involvement includes the PNB Darby Park Executive Suites in Kuala Lumpur, Harvard Suasana Hotel in Kedah and Darby Park Executive Suites in Singapore. KUALA LUMPUR: The Valuation and Property Services Department is already seeing signs of a decline in selling prices and rental yields within the Malaysian property market in the first quarter of 2009. Director-general Datuk Abdullah Thalith Md Thani attributed the reasons for the price and rental dip to the global economic downturn and the poor market sentiment locally. Deputy finance minister Datuk Wira Chor Chee Heung (left) officiating the launch of the 2008 Market Report with Valuation and Property Services Department director general Datuk Abdullah Thalith Md Thani (right). Looking on in the background is Valuation and Property Services Department deputy director for valuation Abdul Hamid Abu Bakar. “Given the choice, I want conditions to improve tomorrow. But I don’t want to speculate when it (the economy) will recover,” he said at the launch of the 2008 Property Market Report yesterday. He said he expected both the (RM7bil and RM60bil) stimulus packages and the on-going projects under the Ninth Malaysia Plan to help cushion the effects of the global financial crisis. He also said he was optimistic about the number of property transactions during the first three months of 2009. The local property market recorded 340,240 transactions valued at RM88.34bil in 2008. The transaction volume recorded a 9.9% increase (2007: 309,455 transactions), while value grew by 14.5% against 2007’s RM77.14bil. The residential property sub-sector remained the most dominant sub-sector in 2008, comprising 63.7% of total volume and 46.8% of total value of transactions. In total, 216,702 transactions worth RM41.30bil were recorded in 2008 against 199,482 transactions worth RM36.5bil in 2007. By price range, houses costing below RM200,000 continued to be the most sought after, comprising 75.1% (162,689 transactions). 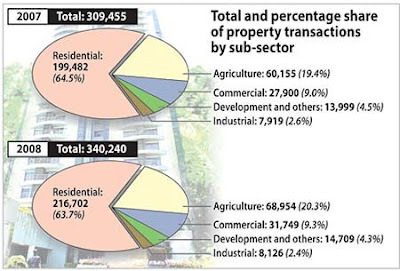 The agricultural property sub-sector was the next most transacted, forming 20.3% of total transactions, followed by commercial property at 9.3%, development land (4.3%) and industrial property (2.4%). Abdullah said the industrial property sub-sector would be the most vulnerable in 2009. “It (the industrial sub-sector) has been affected for quite some time already and its contribution to economy is not big. But I am not so concerned about this sector because an industrial development can always be redeveloped for different sector usage,” he said. He also said the high-end segment of the residential property sub-sector was most likely to be affected, given the current economic situation. Deputy Finance Minister Datuk Wira Chor Chee Heung, who graced the event, expressed optimism about the local property market. “Malaysians have a high savings rate. The stimulus package should also help to spur the local property market. In terms of demand, property in large populated cities like Kuala Lumpur and Johor Baru will also continue to sell,” he said. PETALING JAYA: EcoFirst Consolidated Bhd aims to achieve a yield of up to 7.5% annually for its South City Plaza in seven years after the rebranding of its key property asset into an educational mall due for launch on Friday. Tiong Kwing Hee (inset) says South City Plaza will be rebranded as Edu Mall @ South City. Executive director Tiong Kwing Hee said the rebranding of the Edu Mall @ South City was part of the group’s restructuring exercise to give a good return for its long-term investment in the property. “We aim to sell the property to real estate investment trusts once we achieve our targeted yield within seven years,” he told StarBiz. Currently, about 4,000 students are receiving higher education and vocational training offered by eight institutions at the five-storey mall in Seri Kembangan, Selangor. Among them are EcoFirst’s 27%-owned associate SEG International Bhd (SEGi), International College of Health Sciences and Summit Multimedia Education Sdn Bhd. The group targets to increase the number of students at the mall to 6,000 by year-end and 10,000 by end of next year. “We have allocated about 25% of the total lettable area of the mall, or 200,000 sq ft, for these educational providers, which received competitive rental rates of RM1.50 per sq ft from us,” said Tiong. To enhance the value of its property, EcoFirst plans to build two blocks of 13 to 14-storey apartments which can house about 3,000 students on top of the mall to be leased to SEGi. With a gross development value of RM75mil to RM80mil, the serviced apartments were expected to be completed within 24 months after construction starts in the fourth quarter. “We plan to take about RM50mil in bank loans to fund the project, which would cover about 73% of the costs,” said Tiong. 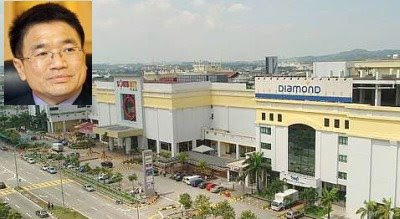 EcoFirst had last year invested about RM5mil to give the mall a facelift. MALAYSIA'S property market is expected to worsen this year as the global economic uncertainties deepen. The Valuation and Property Services Department of the Finance Ministry director-general Datuk Abdullah Thalith Md Thani said the local property market will fall moderately further this year, with signs of pressure looming. This is based on data collected by the National Property Information Centre in the first quarter of this year. "It showed negotiated price and rental rates are heading downwards," he said at the launch of the Malaysian House Price Index and the Property Market Report 2008 by Deputy Finance Minister Datuk Chor Chee Heung in Kuala Lumpur yesterday. Abdullah Thalith said the number of new housing projects launched in 2009 will remain as last year. But property transactions and value are expected to drop by 5-10 per cent in the current year, unless the government's RM67 billion stimulus packages bear fruit soon. "The effects of the stimulus packages will have to kick in soon to cushion off the effects in the global economic crisis and for the property market to recover," he added. Last year, the property market recorded 340,240 transactions with a total worth of RM88.34 billion, indicating a growth of 10 per cent and 14.5 per cent respectively. The residential segment was the most dominant sub-sector, accounting for 46.8 per cent of the transactions and 63.7 per cent of total volume. Abdullah Thalith said the industrial sub-sector will be the most pressured this year as the majority of the companies are service or export-oriented and affected by market turbulence. A total of 8,126 transactions worth RM7.9 billion were recorded last year, which was an increase in volume by 2.6 per cent and 11.5 per cent respectively. In line with the dismal outlook in industrial activities, the number of industrial overhangs, unsold under construction and unsold not constructed units grew by 30 per cent. Earlier, Chor urged developers to weigh a project's viability thoroughly and innovate where possible, before embarking on new developments. "Lower costs will enable you to offer buyers attractive packages. Make less profit now, but build your goodwill so that when the economy uplifts, you will be the property provider of their choice," he said. Chor said there is no doubt that demand for all properties will go through a slow period. But there are no signs of a bubble development as the government is stabilising property prices. He said based on the Property Market Report, the average price of all property sub-sectors in 2008 was on the uptrend. PROPERTY online portal iProperty.com Malaysia has launched a one-stop website for Malaysia My Second Home Programme (MM2H) to educate and help foreigners interested in the programme. The group has teamed up with iHome Management & Services Sdn Bhd to jointly launch the online portal in www.iproperty.com.my. “It will serve as a link between potential participants and the agents who will educate them about the programme and assist them in the application process,” iProperty.com group executive chairman Patrick Grove said in a statement. The property market looks set on the path of moderation in 2009 with prices and rentals correcting and construction activities easing slightly amid the current economic situation. However, it is unlikely that prices and rentals will plunge in the coming years, said Valuation and Property Services Department, Ministry of Finance in its report released today. The department said the residential sector is expected to gain from several measures under the Budget 2009. For 2008, the property market recorded 340,240 transactions valued at RM88.34 billion, it said. The transaction volume recorded 9.9 per cent increased from 309,455 transactions while value grew by 14.5 per cent from RM77.14 billion. During the year, the primary market did not perform as well as the previous year as there were 48,830 new housing units offered for sale, of which only 21,725 units taken out. In tandem with the dismal performance of the primary market, the number of residential overhang increased by 9.1 per cent to 26,029 against 23,866 units in 2007. The report was launched by Deputy Finance Minister Datuk Wira Chor Chee Heung. PROPERTY developer Island & Peninsular Bhd (I&P) has turned bullish on sales this year, thanks to the good response to a promotion campaign it launched in February. It now expects to maintain revenue of RM750 million that it made for the year to December 31 2008. In March, I&P's chief told Business Times that the company was expecting revenue to fall by a third due to slower sales. "Cautiously, we will try to maintain last year's revenue. We have a few strategies. We will be more innovative and may extend the campaign to boost sales," managing director Datuk Jamaludin Osman told Business Times in a recent interview in Kuala Lumpur. I&P, a wholly-owned unit of state-owned fund manager Permodalan Nasional Bhd (PNB), has been getting good responses from the public since launching its Mad About Homes campaign. In just two months, it sold 77 units of double-storey terraced houses and semi-detached homes, worth almost RM35 million. These are units within its Bandar Kinrara, Alam Impian and Alam Sari townships in Puchong, and Shah Alam and Bangi in Selangor. I&P is also selling more bungalow lots this year. It is releasing 15 lots for sale by way of tender, with reserve price starting from RM546 to RM572 per sq ft, at its 17.01ha Seri Beringin development in Bukit Damansara, Kuala Lumpur. The company normally sells about five to seven lots a year. Jamaludin is optimistic of selling all the 15 lots by the end of this year. Since 2005, the company has sold 54 bungalow lots in Seri Beringin. I&P, which is focused on developments in the Klang Valley, is also reaching first-time buyers from outside the region. It is collaborating with PNB to promote its products and developments. To do this, it is participating in Minggu Saham Amanah Malaysia (MSAM) 2009 in Johor Baru, Johor. Jamaludin said I&P is taking the opportunity to participate in MSAM as it will be a good opportunity to showcase its properties. "By participating in MSAM, people can identify PNB, not just as a unit trust conglomerate, but having companies who are reliable and giving dividends to the group. We hope to also get more exposure and recognition from Johor market and increase our database," he said. I&P has been participating in MSAM since the first exposition in Kuala Lumpur in 2000. PROPERTY developer SP Setia Bhd is keeping mum on its plan to acquire three real estate companies under Permodalan Nasional Bhd (PNB). The three are Island & Peninsular Bhd, Pelangi Bhd and Petaling Garden Bhd. "It is too early to comment. This issue is very sensitive. Whatever we do, it must add value to our business," SP Setia president and chief executive officer Tan Sri Liew Kee Sin said on the sidelines of PNB's Malaysian Unit Trust Week 2009 in Johor Baru yesterday. Liew was commenting on a foreign news report quoting RHB Research Institute Sdn Bhd as saying that SP Setia may acquire the three companies from PNB to increase sales and gain financial backing from the government. RHB Research said the acquisition may increase SP Setia's value. The property units have a combined annual sales of more than RM1.31 billion, similar to SP Setia's 2008 figures. As of January 30, PNB owned a 6.5 per cent stake in SP Setia, according to Bloomberg's data. AXIS Real Estate Investment Trust's (Axis-REIT) revenue for the first quarter ended March 31 2009 rose to RM17.3 million from RM14.5 million in the same quarter last year. Net income rose to RM10.4 million from RM9 million previously, Axis REIT Managers Bhd, the manager of Axis-REIT, said in a statement in Kuala Lumpur yesterday. Axis REIT Managers' chief executive officer Steward Labrooy said the company has maintained its earnings momentum despite the current global financial crisis. "With the implementation of a quarterly distribution policy, we are now able to reward our unitholders on a more regular basis," he said. The policy entails at least 95 per cent of the current year-to-date distributable income for the first to third quarters and at least 99 per cent of the current year-to-date distributable income for the fourth quarter. Labrooy said the company would continue to focus on providing steady yield accretion through enhancement of the current portfolio, prudent capital management and examining investment opportunities as long as the gearing was capped below 40 per cent. He said the company was optimistic Axis REIT would be able to maintain its current performance for the coming quarter and the rest of the financial year ending December 31 2009 boosted by the current satisfactory performance of the trust's existing investment portfolio. I-Bhd, developer of i-City in Shah Alam, plans to build an Islamic resource centre for the creation of an Islamic financial sector in I-City. I-Bhd said the project is slated to start at the end of next year. "The first completed phase of i-City has Al-Rajhi Banking Group, a premier Islamic financial group, acquiring 80 per cent of its 300,000 square feet Grade A cyber office suites," I-Bhd said, adding that other global companies had also expressed interest in i-City. "In fact, i-City has already attracted tenants, such as UK’s Logica and Singapore Unified Communications, to name a few," I-Bhd said in a statement. The i-City development is in line with I-Bhd’s vision to build a knowledge-based economy with i-City.